Card spinners or suspension spinners add a lot of interest to a card and are so easy to make! I had a 50th birthday card to make for a friend, and this card came together pretty quickly once I remembered the spinner idea. 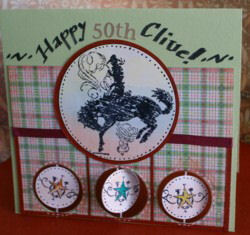 I already knew I wanted to make a bucking bronco card for my friend as he was having a cowboy birthday party, and the spinners 'git' right in with that theme in my own head! Oh and these cards are also called Suspension Cards. You don't have to use the particular paper punches I used to make your spinners but do make sure you have circle punches that allow you to make two different sized circles that are not too different in size for layering them together. The Layering Circle Dies and your Big Shot might suit your purpose. 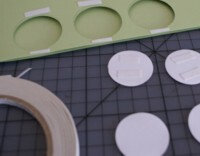 Place tape at the top and bottom of the holes on your card front, and then to the back of one of the spinner pairs. Carefully place the spinner pairs behind and in front of the floss so they align well. Now cover the front of the card with your punched designer pape. Go ahead and finish decorating your card. However you make them, enjoy making your Card Spinners.